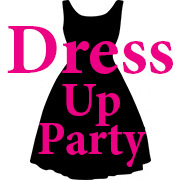 When Sara kindly asked me to join her Dress Up Party, it gave me just the excuse I needed to make another Cambie dress. 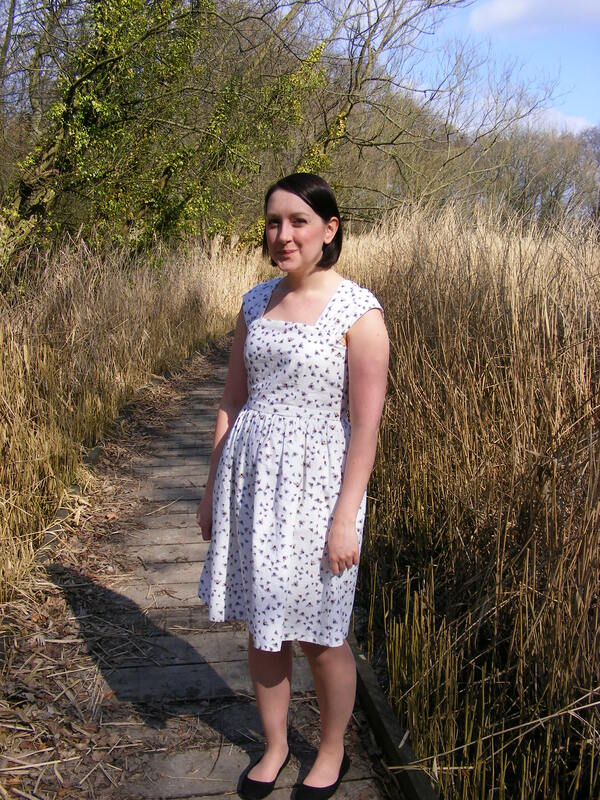 The Cambie is such a sweet little sewing pattern with enough variations to make it feel like you’re customising your dress to what will really suit you. Here I chose the square front and full skirt without the waistband. 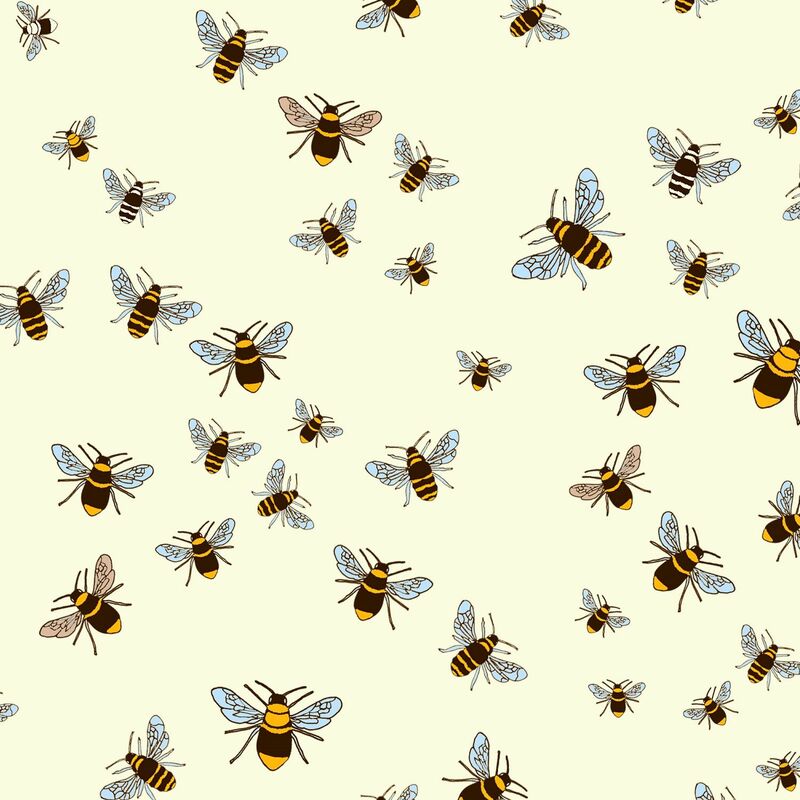 The outer fabric is a bee print Makower cotton – this is the white colourway but there are some gorgeous other colours – making this my Cam-bee dress heehee. I don’t sew with many quilting cottons these days, nor do I often wear white, but I couldn’t resist this print. I also lined the dress in white habotai (I love a fully lined dress). As this is my second version I think I’ve worked out all my fitting issues. I staystitched the neckline before sewing as my first version stretched a little. I also recommend a muslin to make sure those sleeves don’t fall off your shoulders. I omitted the waistband because I find them a little uncomfortable on my stomach but perhaps that’s just me. Another helpful thing I did on this version was to make a pair of little chains on my overlocker and attached one end to the tops of my pockets and the other ends were caught in the waist seam. This helps stop the pocket bag sagging. It would be more ideal if the pattern had the top of the pocket bag caught in the waist seam but I suppose that could get a little bulky. One thing I’d like to mention is that Tasia’s instructions are very succinct I’m always impressed reading one of her pattern booklets at how efficiently she takes you through the work needed in a small number of steps. 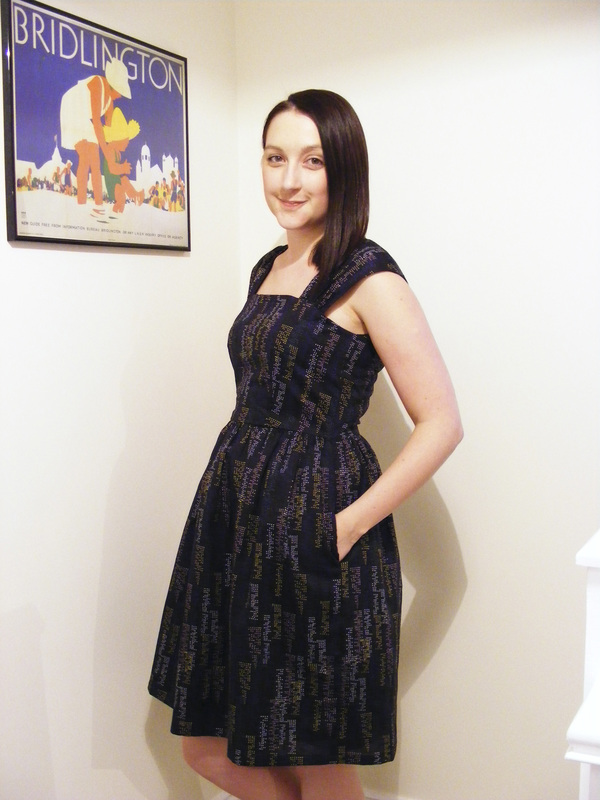 I have three Sewaholic patterns and I’ve not struggled making any of them. I’ve said it before but I’m not sure if I’ll try the sweetheart version or the fitted skirt but I’m super keen to try a button up version after seeing Rosie Wednesday’s cute candy cane variation. 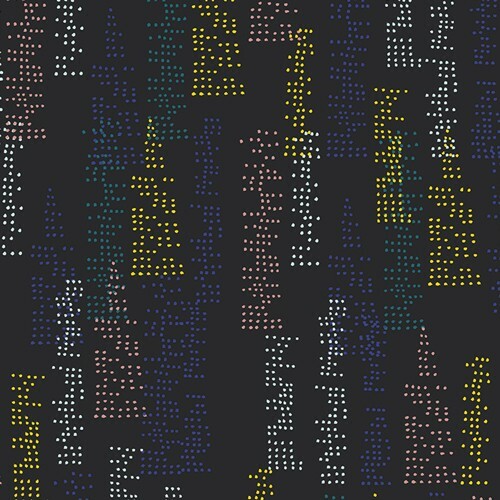 Such a clever hack of the pattern! I also have some horse print chiffon lined up for another version. These pictures were taken at the lake near my house. It’s a small lake where people walk their dogs and go fishing. There’s a flat wooden bridge that goes across the lake, with high reeds either side that almost hide it. It was so sunny when we were there I struggled not to squint in the photos. 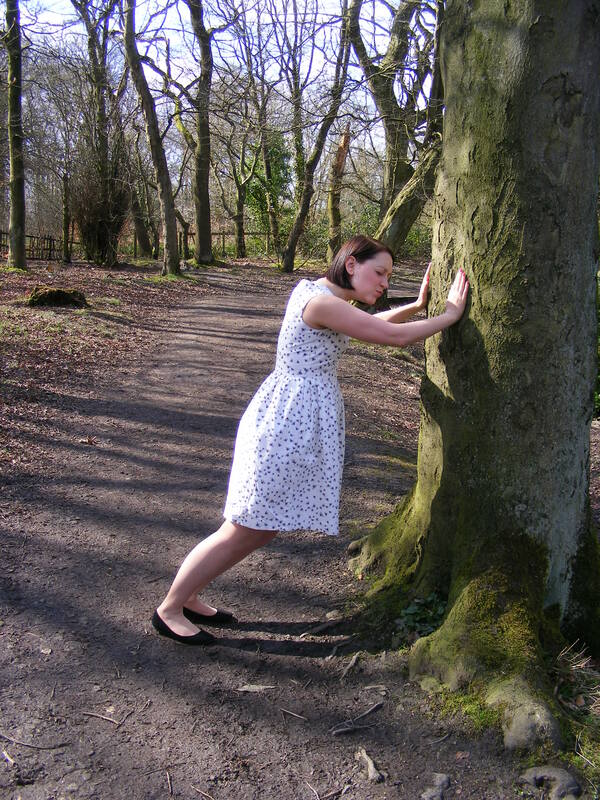 Time to sign off, but here’s a bonus picture of me pretending to push over a tree. 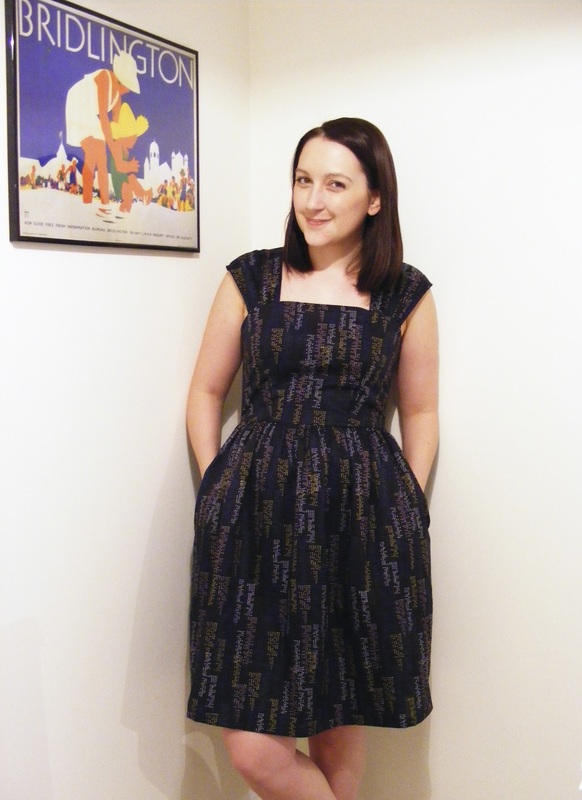 Sometimes it feels like I am last person out there to make a Cambie dress. But I’m so happy to put an end to that! I got the pattern and this luscious voile from The Village Haberdashery. It’s called City Lights Night (say that ten times fast!). In fact everything for the dress came from the shop, a new dress kit handed to me by the postman! The selvedge of the fabric says “Feel The Difference”. And you do. It’s soooo buttery soft and pretty close to being opaque. Perfect for a floaty girly dress. Annie has stocked lots of the new gorgeous Art Gallery Fabrics line. I’m super in love with the Gramercy prints; the colours of City Lights Night are so pretty and Central Park in Fog is so moody and romantic. 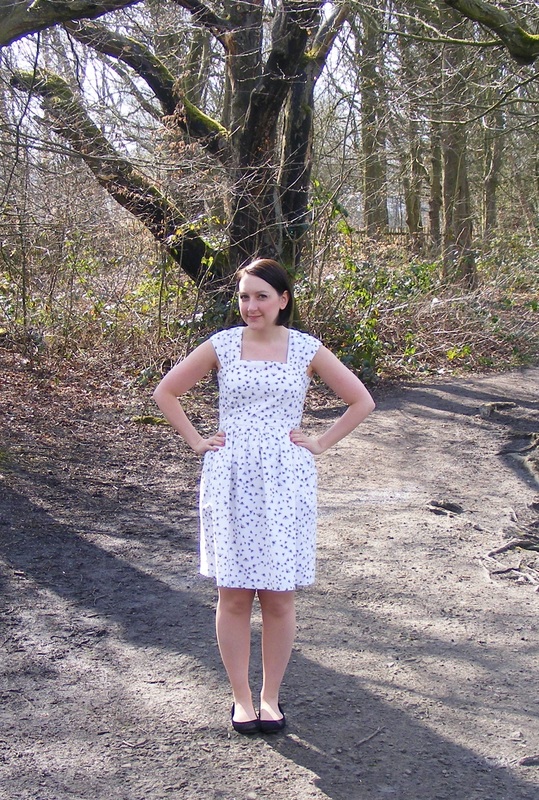 The Cambie is such a nifty little sewing pattern, I love a fully lined dress. I used habutate lining in black which matched the weight of the voile perfectly. I love it when a plan comes together. Perfect for swishing. The fit is pretty good I think. The darts could do to be a touch wider at the waist but that gives me a little room for dinner heehee. I’m also really happy that the sleeves don’t fall off my shoulders and the armholes fits nicely. As you can see I went for the square neckline and I omitted the waistband, that combo pretty much stuck in my mind after seeing Roisin’s tape measure dress. I’m not sure if I’ll try the sweetheart version but I’m super keen to try a button up version after seeing Rosie’s ace candy cane version. That’s a (pretty darn) invisible zip and I used a super fine needle as I would have been gutted to have big snarly catches in the fabric. I decided the triangle shapes on the print should point downwards. That doesn’t seem to be how it was designed to be looked at but who cares, I love it. And wahey, pockets! I nearly omitted them and then I thought, don’t be so miserable and put them in. and importantly the customer service is top notch. Annie went out of her way to order me the electric purple chambray for my Belladone while I was stood in the store with her. And even though she could have gotten sick of me bugging her about it, she still emailed me to let me know as soon as my much lusted-after metallic bird fabric hit the shelves. 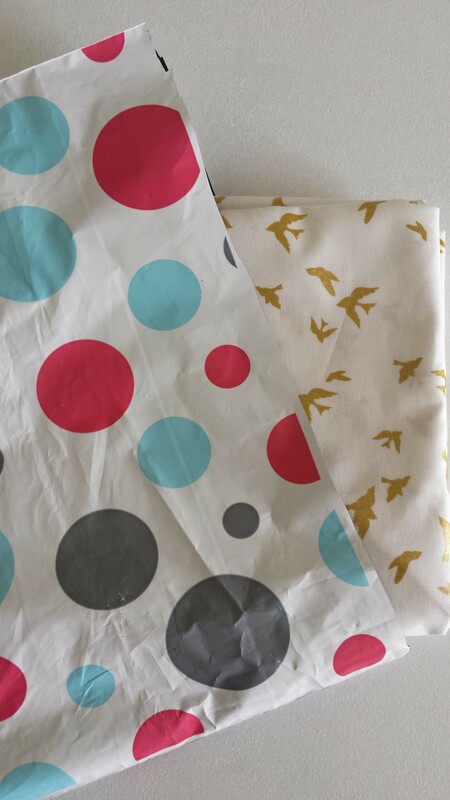 Plus there are polka dot bags and a flat shipping rate, so enough said. The finished dress makes me so happy. That’s how all dresses should make you feel right? I’m going to wear this out to the ballet next week. My mum and I are off to see The Great Gatsby!